After hearing so much about RIM's PlayBook it was good to get the opportunity to take this one for a spin, and while I certainly see what the fuss is about the device still faces hurdles ahead. What struck me most about it was how light and balanced it felt in hand. No wonder: This 7-inch screen device measures just 0.4 inches thick versus the 0.5 on competitors Apple iPad and Samsung Galaxy Tab. The PlayBook also weighs in at just 0.9 pounds, less than two thirds the weight of the 1.5-pound first-gen iPad and about the same as the Samsung Galaxy Tab. The unit's design is very clean; navigation is entirely gesture-based so there are no buttons. There are four primary navigation swipes and each can be used in combination. Swipe up once to get to the main navigator pane, swipe up again to close an app. The center navigation pane is where the primary action happens, but there are tabbed headings to flip among apps along with a navigation scroll bar running along the bottom. All of the navigation happens within the screen. The PlayBook also supports multitasking and 1080p playback and output. It runs a 1GHz ARM Cortex A9 dual-core processor, and sports 1GB of RAM, a 1024 by 600 pixel 7-inch display, and the BlackBerry Tablet OS. the PlayBook is a 3G and Wi-Fi enabled device out of the gate, but BlackBerry 4G PlayBook was announced for summer time at CES. I liked how smoothly I could navigate among apps, how responsive the touch screen seemed, and even how some of the demo apps functioned (for example, the Adobe Reader app lets you flip pages by swiping left and right). There was no task killer, though, and when I asked how a user knows how many apps are too many, and they should start shutting them down manually, I didn't get a direct response (beyond hearing that you can open lots of apps). The one design oddity I picked up on, though, was the prominent placement of the speakers in the bezel. The positive to this front-facing location is that the audio comes at you, instead of being piped out the back like every other vendor. The con is that my fingers appeared to naturally fall right to those spots when I was holding PlayBook in landscape orientation with two hands. While the PlayBook's design and ecosystem look promising, it has other challenges ahead. Yes, it supports Adobe Air, Adobe Flash, and HTML 5 open standards for app development, but even so RIM has a lot of catching up to do to provide the app breadth that Google Android and Apple iOS provide. The other catch (or pro, depending upon how you consider it) is that the messaging specific apps that BlackBerry is known for (calendar, e-mail, contacts, and BlackBerry Messenger) require tethering to a BlackBerry to work. Yes, that also means there's no trace of your work stuff on your play tablet, but I can't help but think a tablet needs to have a multipurpose existence, too. 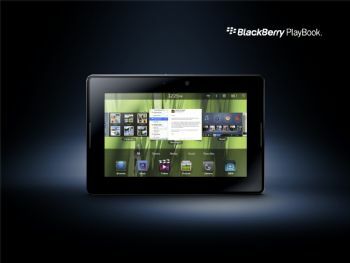 PlayBook is shipping in the first quarter of 2011, with pricing to be announced.